Thank God the constitution has at last been published. I was beginning to run out of excuses in April for its delay and it is now August. According to you and me it has taken 5 months to translate the Constifusion into Fijian and Hindi. The unique way that the Attorney General, AiyASS Sayed Kriyum Pays, has looked at creating the constitution caused the delay. In normal times one would get the best legal brains and constitutional experts like Yash Ghai to construct the constitution but Kriyum Pays has got some of the highest paid criminal lawyers in Australia to look at the Constitution to make sure that he and the other armed robber Mr BEANimarama will never be convicted for any crime. It all starts with the immunity clause. Like any normal Dictator’s immunity clause it excuses any crime they might have committed whilst in power or when they overthrew a legal government. But where this immunity clause is different is that it gives them immunity for crimes they have not yet committed. 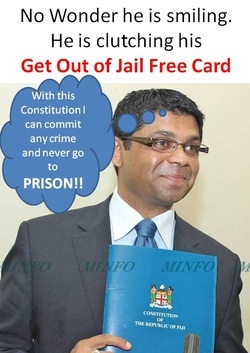 AiyASS Sayed Kriyum Pays and Mr BEANimarama will have a full year from when the constitution is promulgated in September 2013 until the elections in September 2014 to commit as many crimes as they like and they cannot be arrested or imprisoned. It is truly an Armed Robber’s charter. If that is not enough under the new constitution the AG gets to choose all the senior legal officers of the country. The Chief justice, the Head off DPP and the Supreme Court are all picked by the AG and we all know who will be the AG in the first parliament. That’s right Kriyum Pays. As you know he has said the Attorney General does not need to be an elected Member of Parliament. He knows he is the most hated man in the Bananas Republic and would never get elected. You can just see the interview for the DPP position. Not only that but AiyASS Sayed Kriyum Pays can continue to write decrees right up until the election day. I heard that in the next budget he is going to rename VAT to the Venerate AiyASS Tax. He will also increase it to 15%. Every transaction in the Bananas Republic will have to pay this levy and unlike the current VAT system there will be no refunds. Aunty Nur Barmy Aunty is already busy setting up another secret bank account for him. The other safeguard he has included is that for the rest of the year he can make changes to the constitution with a cabinet decision. So if he realizes there is any danger to his power he will change it immediately. On the other hand if anyone else wants to make any changes they need to get 75% of MPs and 75% of the registered Voters to agree to the changes. Then to make sure the Dictator wins the election they have created the new super constituency. The whole of Fiji and all Fiji Citizens anywhere in the world will all be voting for the same constituency. He has done a study that shows with only small amounts of rigging he can guarantee a landslide win for the Dictator Mr BEANimarama. Grubby I am going to tell you a secret. I always feel a bit, you know, turned on whenever I am in his presence. I guess like every good Ozzie convict’s daughter I have a fantasy of being a criminal mastermind’s floozy. Just writing this letter to you has left me feeling a bit you know horny. I can’t wait for you to come on round with a bottle of Champagne to celebrate the new Crimestitution. Under the new Constitution the RFMF will have its name changed to ARM. Armed Robbers & Mercenaries.